YOU THOUGHT you were noble because you gave up a Sunday afternoon to watch your kid play soccer? Noble parenting is deciding to adopt not one, not two, but three kids. Who are a pair of 15-year-old twins and a 12-year-old. And whom you’ve never met. It was beyond sweet for R. to consider her baseball-loving father’s feelings in making this declaration. Of course, I told her that it was fine and that all I wanted was for her to be happy playing. If that happiness came from playing soccer, so be it. THE GIRLS had a choice yesterday: Help Mrs. D. with a massive cleaning of the house inside, or join me outside for the final leaf raking of the year. They bopped back and forth a few times before settling with me in the front yard, where the year’s most ironic statements were made. TWO PEOPLE took pity on me at the Barnes & Noble in Plymouth Meeting yesterday afternoon. One was a teacher, the other a bookstore staffer. What earned me their benevolence was the completely useless discussion I was having with Q. over what I would buy her. I was arguing for books that reflected her status as a kindergartener who’s reading at a second-grade level. She dug in her heels over a princess sticker book. Yes, Andy Reid Should Be Fired. No, You Shouldn’t Be Happy About It. THEY’RE CALLING for a man’s job here in Philadelphia, and chances are they’re going to get it. 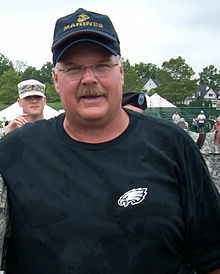 Eagles head coach Andy Reid long has been the subject of fans’ frustration over his perceived arrogance and failure to bring a Super Bowl to town. “Fire Andy” is not a novel chant at the Linc this season. But now, amidst a six-game losing streak, catastrophic mismanagement of his coaching staff, mediocre drafting, awful personnel decisions, and continued in-game gaffes, the Eagles’ failures are real, not imagined, and Reid’s fingerprints are smeared all over them. MOST 10-year-olds lack the capacity to offer a full rendering of their feelings and experiences regarding a week’s worth of completely new activities, surroundings, and people. And so it is difficult to determine where R.’s heart was with respect to the week of sleep-away camp from which we picked her up last weekend. She was presented to us with frizzed-out hair, a body devoured by insects, an ear-to-ear smile, and crushing hugs. Yes, she had fun. The food was … okay. Rock climbing and zip-lining were awesome. She made some new friends. The nighttime thunderstorm that woke her up sent her scurrying to her counselor. She missed us terribly. The question of questions, of course: Would you go again?